Jericho is Tom's younger brother who grew up alongside Mark, Tom and the rest of their friends in the small village of Pikao. 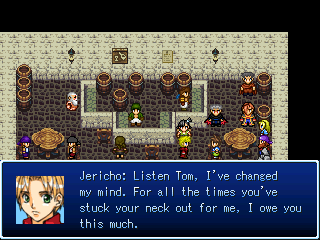 A few years before Tom and Mark set out on their grand adventure, Jericho already left the village to embark on an adventure on his own. Since he knew his parents wouldn't approve of him to leave the village at the age of fifteen, he secretly hid himself on a merchant vessel and escaped the boring life in the village as a stowaway. After travelling around for a few months, Jericho wound up at the Eagle Kingdom. Here he managed to get himself involved in the Brutolian Revolution that had just broken out, under the guise of the nickname "Killer". Jericho's motive for joining the revolution was not so much political (like his allies), but rather out of boredom and the desire to rock the boat and be a rebel. He had grown sick and tired of his parents always telling him what to do, so now he wanted things to be different. When Tom, Mark and the others set out for the Eagle Kingdom to meet with Delium, their ship gets attacked by Jericho and his crew. 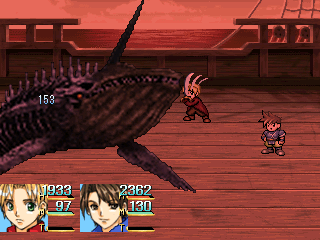 Even though he's facing his brother and a former friend, he doesn't hesitate to try and pirate their ship. Without success - Tom and the others repel the attack and defeat Jericho's crew instead. Because he does not want to admit defeat to his brother, Jericho then sets his own ship on fire and disappears from the scene. Later on, as the end of the revolution draws near, Jericho and Tom have another encounter in the small fishing village of Vultura. Here they have a short conversation in which they establish some sort of mutual understanding, and afterwards they part ways once more. 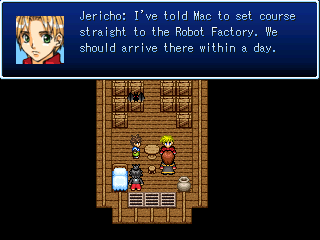 Jericho is a very strong fighter who favours attack power over defensive capabilities. He's one of the few fighters in the game capable of equipping two weapons simultaneously, thus effectively doubling his damage output with 'Fight'. However, Jericho's main selling point is his ability, 'Rage'. Each time he uses the 'Fight' command, his rage builds up. He can then use the 'Rage' command to use some of the strongest attacks in the game. The more times you've used fight, the stronger your rage will be. However, each time after using a rage, the gauge will be reset. Time it wisely!